Two-three class periods. You may choose to have the students read the “The Husband of the Rat’s Daughter” before beginning the experience. 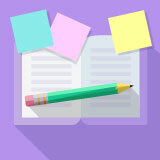 In this experience, you will identify various kinds of figurative language including similes, metaphors, personification, alliteration, and assonance, and you will explain why authors use it in their writing. You will also have an opportunity to write your own text using figurative language. Have you ever heard the saying, “I feel like I am floating on cloud 9!”? It does not mean that someone is really floating in the clouds, but that the person is feeling extreme happiness or excitement. This is an example of figurative language. Specifically, it is called an idiom. Read the list of the following idioms with the actual meanings in parentheses. Have the students review the posts and discuss the images.